SNORKEL: YES | DEPARTS: DAILY | CHOOSE: DATES | LUNCH: YES | PRICES | ASK A QUESTION? 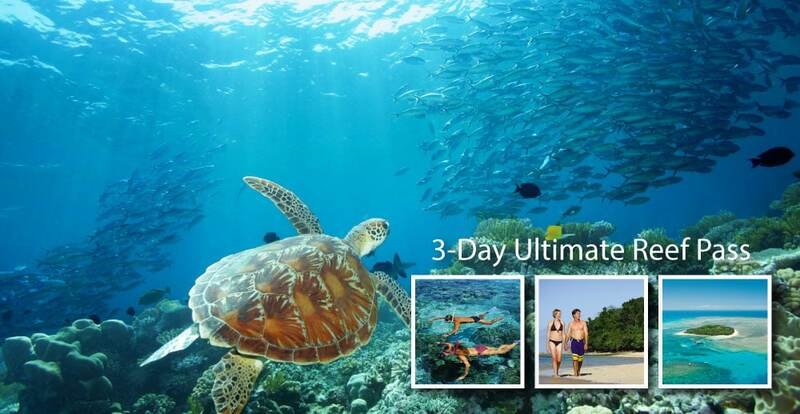 Cairns 3 Day Ultimate Reef Pass - Choose Any 3 Reef Tours! The Cairns 3-Day Ultimate Reef Pass allows you to experience the very best of The Great Barrier Reef over 3 days. The Ultimate way to save time and money and really maximise your time visiting the reef. Snorkel & Cruise on any 3 Quicksilver Group of products. These include; Poseidon Dive & Snorkel (Port Douglas), Silversonic Dive & Snorkel (Port Douglas), Quicksilver Outer Barrier Reef Cruises (Port Douglas), Silverswift Dive & Snorkel (Cairns), Ocean Spirit Cruises (Cairns), Wavedancer Low Isles (Port Douglas), Great Adventures Outer Barrier Reef Cruise (Cairns) and Great Adventures Green Island Cruises (Cairns). 1 - The 3 Day Ultimate Reef Pass must be used within 7 days of the first day of travel. 2 - Hotel Bus Transfers are Not Included. These can be booked and paid for after you have booked your pass. 3 - Reef Tax is Not Included. $6.50 Reef Tax per person to be paid on each day of travel. 4 - No Lunch Included on the Green Island Day Tour. You can add Intro Diving or Certified Diving, please check each products page for additional Diving Costs. Click the links above to find out more about each product! SAVE OVER - $258.50 BOOKING THE CAIRNS 3-DAY ULTIMATE REEF PASS! Choose your travel dates on the tour booking form. Remember the pass must be used in the first 7 days of the first date of travel. Child Age is classed from 4-14 years old. A Family is classed as 2 x Adults & 2 x Children.